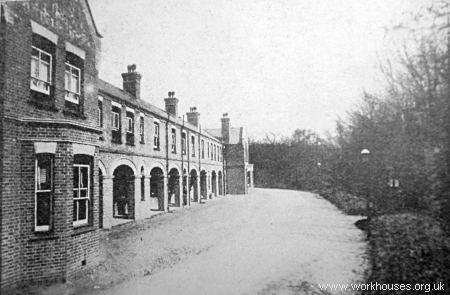 The Southern Convalescent Fever Hospital at Gore Farm near Dartford was one of the two such hospital sites to be established by the Metropolitan Asylums Board, the other being the Northern Hospital at Winchmore Hill. The MAB had been set up in 1867 to administer care for certain categories of the sick poor in metropolitan London and between 1870 and 1900 set up a ring of infectious diseases hospitals around the capital. After the passing of the 1891 Public Health (London) Law Consolidation Bill, the MAB entered a period of expansion, of which the Southern was a part. 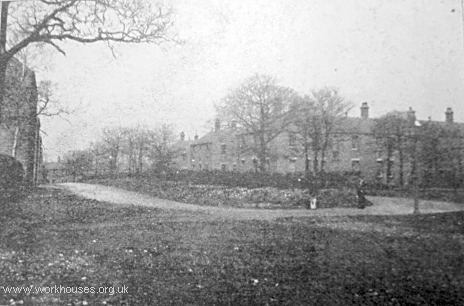 The 159-acre Gore Farm site was acquired by the Board in 1883 at a cost of £16,000 and lay in an elevated position immediately to the south of another large MAB establishment, the Darenth Park Imbecile Asylum. Initially, in March 1884, a temporary camp, known as the South Smallpox Camp, was set up in response to smallpox epidemic which had filled the Board's London hospitals and the hospital ships moored on the Thames at Long Reach. 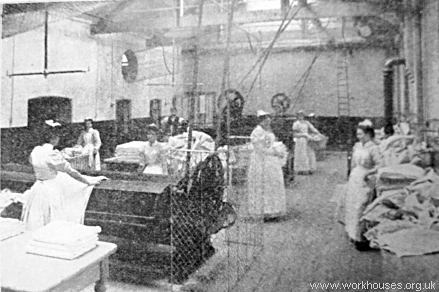 The 300-bed camp, then the largest civil hospital of its kind, took convalescing patients and so freed up hospital beds for use by more urgent cases. Being only four miles from Long Reach, Gore Farm could either take patients from the hospital ships themselves, or make use of the river ambulance service between Rotherithe and Long Reach. In fact, an earlier version of the camp had already been set up in May 1881, at the rear of adjacent Darenth Park Asylum which was then just approaching completion and was unoccupied. Patients had slept in tents, with the asylum providing kitchen and sanitary facilities, and indoor wards that could be used as an alternative in bad weather. In addition to ward tents, the new facility had thus to be equipped with its own kitchen, bath-house, sanitation and so on. The new camp was erected at the south-west of the site under the direction of architects A and C Harston. It comprised twenty 50ft. by 25ft. hospital marquees for use as sleeping tents — nine for women and children, six for men, three for nurses, and two for male staff. There were also two larger marquees for daytime use by male and female patients, as well as tents for the medical superintendent, steward, and superintending nurse, and numerous other smaller tents used as sculleries or commodes. The sleeping tents formed a double row, with a space of 80ft. in between, and with 50ft. between the tents in each row. The hospital tents were supplied by Messrs. Pigott Brothers and Mr John Edgington and had wooden floors raised from the ground on brick piers. Each tent had a canvas porch and a detached canvas closet fitted with a "Moule's" earth commode. The tents were warmed by steam pipes and lit by gas. Each tent could accommodate twenty beds. 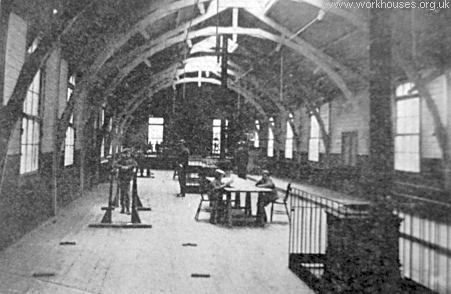 The bathhouse, kitchen, boiler house, disinfecting room, discharge room, and store were all constructed from wood on brick foundations The laundry work was done in the nearby Asylum laundry. In 1886, pressure was mounting for the improvement of conditions for patients on the Gore Farm site. Board member Captain Douglas Galton, much experienced in military barracks construction, ventilation, heating, water supply and drainage, advocated the erection of permanent buildings. Wooden huts, he argued, were a fire hazard, difficult to ventilate, and liable to become saturated with infection. In 1887, against this advice, South Camp was partly replaced by the construction of eight temporary huts. However, in 1890, a permanent hospital was finally erected on the higher ground to north-east of the camp. The two halves of the hospital then became known as the Upper and Lower hospitals. The layout is shown on the 1893 plan below. Gore Farm Hospital site layout, 1893. The plan above shows the eight temporary huts erected in 1887. These were constructed from wood and iron and each contained 26 beds. The medical superintendent's house stood to the south-east of the huts, and an administrative and laundry block lay to their north. The hospital subsequently expanded northwards and by 1909 a further nine lines of huts had been erected as shown on the map below. 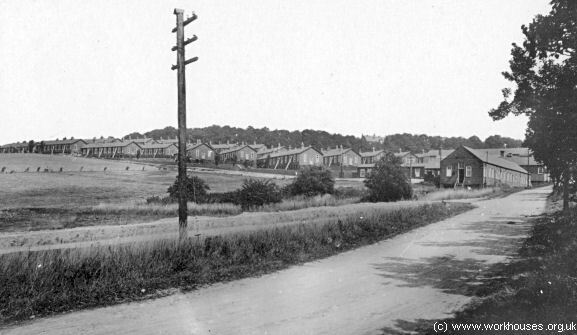 Gore Farm Hospital site, 1909. The southernmost line were used as homes for nurses and maids and had bedrooms and mess rooms. The remaining blocks varied in size but most included a single large ward with a sanitary annexe along its eastern side. A small group of isolation huts stood at the north. Lower Hospital site from the south-west, c.1915. The Upper Hospital comprised a two-storey administration block, with a kitchen block and laundry to its rear. Gore Farm Hospital site, 1902. Gore Farm administration block, 1902. 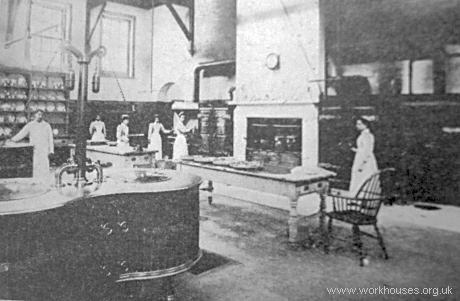 Gore Farm kitchen interior, 1902. 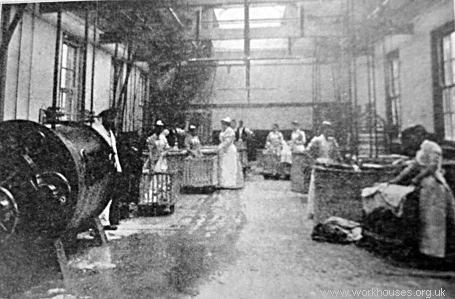 Gore Farm patients' washhouse, 1902. Gore Farm ironing room, 1902. At each side of the kitchen block lay two-storey staff blocks, with males at the east and females at the west. A three-storey nurses' home and a three-storey block for female domestic staff stood either side of the boiler house. There was also a two-storey temporary hut for night nurses. 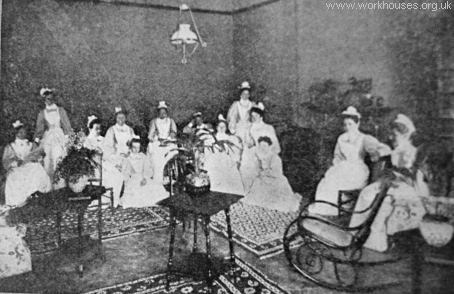 Gore Farm nurses' sitting-room, 1902. The ward blocks were mostly arranged with their ground floor containing a day room, a dining-room and a play room. The upper floor comprised a nine-bed ward and an eleven-bed ward, each with their own staircase, and separated by a central sanitary annexe. At the south end lay the ward kitchen, larder, store and bathroom. The isolation blocks contained a single large ward with a south-facing bay window. Gore Farm patients' recreation room, 1902. 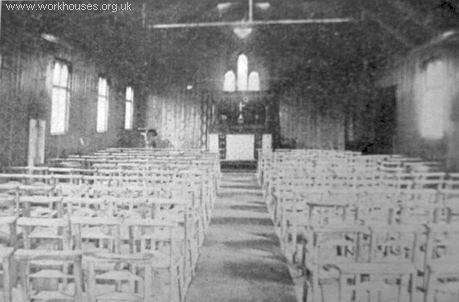 Gore Farm hospital chapel, 1902. Part of the Gore Farm site was cultivated and was irrigated by the sewage from the hospital. In 1908, the Gore Farm Hospital was renamed the Southern Convalescent Hospital. 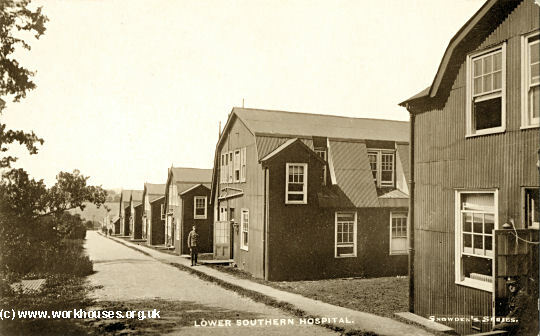 Between 1915 and 1920, the Lower Hospital was used to accommodate German prisoners of war, while the Upper Hospital was used as a military hospital. In 1930, control of the hospital passed to the London County Council. The hospital closed in 1948. The buildings have now been demolished and a by-pass now runs across the site.